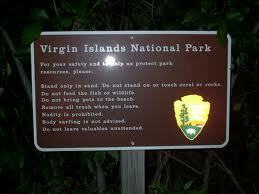 St John is part of the US Virgin Islands and about a 20 minute ferry ride from the Island of St Thomas. Most of the island is protected land, part of the US National Parks system. The cruise ships dock in St Thomas and you can either take a high-priced cruise line-sponsored excursion to St John or you can be adventurous and make your own excursion. This is my 4th trip to the US Virgin Islands in 10 years and my first time there without wearing an extra 200 pounds. At my heavier weight most activities were beyond the physical capabilities of a woman with legs the size of tree trunks. weighing 350+ lbs for two decades. On two previous trips, with Disney cruise line, we traveled by a private ferry over to Honeymoon beach and jumped off the ferry (I rolled off) to swim to the beach and then took an inflatable float with an outboard motor back to the ferry. Dragging my 350+ pounds back up the ladder on the ferry was embarrassing and painful. Putting 350+ pounds of weight on a portion of one bare foot on boat ladder and then trying to lift the rest of your bulk up the next step is excruciating. That is how I learned to wear swim shoes so my feet had some protection. On the third trip (a Princess cruise), our excursion took us by double catamaran to St John and then a scary extended taxi shuttle over the mountains to Trunk Bay Beach. This was a wonderful, clean, secluded and fairly empty beach with the most exquisite clean sand and clear azure blue waters. Scary in that these 'taxis' were pick up trucks with extended sides on their beds that seat 24 people (and should NOT seat 24 people). I won't tell you how close to the edge of the cliff the operator drove us (on roads without safety barriers) but it is the reason my husband and I did not take a Princess excursion on this trip. We did not want to knowingly risk death-by-island taxi a second time. THIS trip we decided to get to the beach of our choosing at the time we wanted to be there and without a death-defying road trip. We knew where we needed to go and when to be there. We got up early so we could have breakfast and be off the ship as soon as we could disembark, at 7:30 AM. We left the Grand Princess with our sunscreen, beach towels, sunglasses, cameras, and bathing suits under our cover ups. We also had two refillable water bottles with filters and two cans of diet ginger ale. My husband wore his thick soled sneakers and I wore my thin little swim shoes. We took an open taxi with another couple to the other side of St Thomas to get to the ferry. Sadly, we missed the 8 AM ferry and had to wait for the 9 AM. At twenty two minutes after nine we arrived on St John and walked the couple of blocks to the National Parks Office for directions to the walking route to Honeymoon Beach. The hiking path to where we wanted to go was only a little over a mile long. Easy, right? A lovely, octogenarian, national park information lady told us where the path began and said we should have no problem with the hike. Hahaha. She either never took the hike herself or thinks everyone wears hiking boots to the beach. Oh, and there are no bathrooms, no showers, no shops, no bars and no huts selling fruit or drinks in the national park and beach. 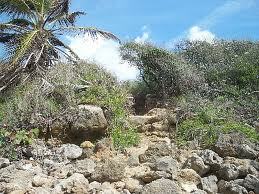 The hike is one mile up a steep path and down a steep ravine (as in cliff) to reach the beach. The beach cannot be reached by bike, car, or even boat, as boats are not permitted to drop people off there. If you want to go to this beach you have to hike. So we hiked. The path started with a double set of stairs into the mountain side and then from that point on we were on rocks. Not smooth, purposely laid rocks. These were sharp, from-gravel-to-boulder sized jagged stones, all happenstance and loose. If I had been wearing sneakers like my husband - no problem. If I had been fifty pounds heavier I would have gone home. Instead, I trudged the path with hubby holding my hand over the drops and rockier points while I tried to balance on the flatter edges of stones in an attempt to not cause too much pain to my feet. I thank God for every pound I have lost. With the weight on me, my feet could never have taken the beating. Climbing down the side of the cliff to get through the underbrush and reach the beach - it could never have happened with even an extra 25 pounds on my sorry knees and ankles. The path was not long but it is for those in shape enough to climb and balance their weight through the trees and down the mountainside. I was annoyed that I did not research this enough to know to wear thick soles but I kept my mumbling and cursing to a minimum because I really wanted to do this. I wanted to save the water so I drank my diet soda before we reached the cut in the cliff wear we could start climbing down the ravine. Once we got down the cliff it was just another twenty yards to the beach. Then is was all worth it. The beach: serene and beautiful. Sand fine, smooth, soft on the feet. The weather was a perfect 78 degrees and at just 10 AM the sun was not yet blistering for my pale skin. The water was so clear and so amazingly, fantastically blue. Perhaps six other people had braved the hike that morning before we arrived and only one person came after us. A total of nine people on the whole beach. We hung our towels, camera and cover ups from a tree and went swimming. We swam for about an hour, taking video with the waterproof video camera our daughter bought my husband for Christmas. At about 11:30 we got out of the water and dried off with towels so we could begin the trek back up the ravine, down the rocky mountain trail and back to the ferry in time for the noon crossing. I always try and get out of the sun by noon, especially at beaches. Even this idyllic location could not convince me to stay in the sun an extra hour. While I have not managed to eat sugar mindfully, I enjoy my beaches mindfully. I get my fill in a short, lovely time. Then I move on to something else and do not look for more of a good thing. The trip back seemed a little easier, perhaps because I knew what I was in for. By the time we reached the stairs we had only five minutes to make the noon ferry - and we made it. I even ran the equivalent of two blocks to get to the ferry on time. We were the last people to board. That afternoon my husband gave me a lovely food massage. Yes, keeping the pounds off is all worth it. 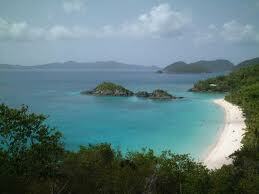 I enjoy the island of St John. It has my favorite beaches of any place I have ever visited to date. I have never been to Hawaii or Tahiti so I believe someday St John's may come in second or third but until that time I will continue to love St John Island and when I return I will thank the lovely, octogenarian, national park information lady for not dissuading me from hiking in my swim shoes. It was great not to miss another piece of my life because of my weight. For every ten pounds you lose, you take fifty pounds of pressure off your knees. Even if you are only keeping 10 pounds off so far, you should see a difference. What has keeping the pounds off done for your mobility lately? Great story, but that trip sounds like torture. I hope to lose a lot of weight before my 70th birthday in mid-2013, so maybe it would be more appealing then. Jim - Torture when I carried all the excess weight but well worth the uncomfortable walking today - and only possible because I lost the weight. Next time I will have the right shoes and we will hike the longer trail to another beach. No torture with the right shoes and weight. I bet when you lose your pounds you will be amazed at what feats your feet can do! Kelliann - Great analogy - thank you! So, so happy for you! This was inspiring to read! Even though I'm still 50 pounds from goal, I've lost 65 pounds and the difference is amazing. I'm going to be 60 in March and I feel like I'm heading for 40- or less. My knees, my feet- all feel wonderful! Congratulations to you and thanks for sharing your story with us.